This is a male Huenia heraldica arrowhead crab (konoha-gani in Japanese, コノハガニ), one of many species of crabs that use other organisms to adorn their bodies for camouflage and protection. Most of the time, decorator crabs seek out and acquire size-appropriate finery. In this case however, the overly ambitious crustacean kept toppling over due to the extreme front-loading caused by his choice of frippery. 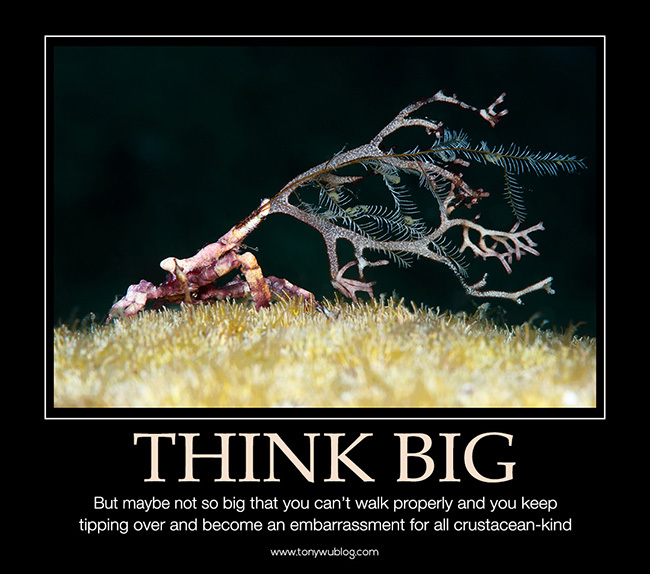 Life lesson from a decorator crab. Who would've imagined?